**Cosmetic treatment is not guaranteed on the first visit. Please call to schedule any cosmetic appointments** Dr. Snell is a board certified dermatologist who has had vigorous clinical training in many areas of dermatology including general dermatology, melanoma and pigmented lesions, treating various medical conditions in skin of color as well as training in cosmetics and surgical procedures. 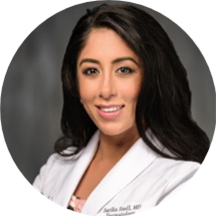 Dr. Snell is originally from the DC area and received her bachelor’s degree from the University of Virginia. She earned her medical degree from Georgetown University and then did her specialty training in Dermatology at the Albert Einstein College of Medicine in New York City. She additionally completed an oncology/melanoma fellowship at the Washington Hospital Center in which she received specialized training in pigmented lesions, dermoscopy and melanoma detection. Dr. Snell is a fellow of the American Academy of Dermatology, the American Society of Dermatological Surgery, the Washington Dermatologic Society, and the Women’s Dermatologic Society. Dr. Snell’s professional accomplishments include presentations at national dermatology conferences, publications in peer reviewed journals and textbooks. Dr. Snell has an interest in skin cancer detection, pigmented lesions and treating medical dermatological conditions. She also has a special interest in cosmetic dermatology and enjoys doing aesthetic procedures using Botox, fillers, lasers, microneedling and other cosmetic procedures. When Dr. Snell is not at work caring for her patients, she enjoys traveling and spending time with her husband and son. My experience was excellent. She explained everything that was going to be done in advance and what I should expect going forward. She was personable, professional, and I was 100% confident in her recommendation. She took a look and said she couldn’t do it and rescheduled with another surgeon. As a new patient with a history of skin cancer, I appreciated her attentiveness, thorough body check and frankness. Consultation is preceded with a staff prepping the doctor as to conditions, concerns etc one might have so it makes for aquick and time-effective appointment, which to me is fine. Highly recommend this doctor and the office efficiency. This was the easiest medical procedure I have ever experienced. Quick, efficient and thorough! She is so nice and listens careful to all problems. Coming back to see her in 6 weeks! This is a terrible office. They failed to call in the anti-biotic that I was prescribed, and I wasn't able to receive it before I left the country. Multiple VMs, multiple hour-long waits on hold, still no resolution. Just terrible. She’s friendly, compassionate, caring. Appointment seemed a bit rushed but to-the-point and clear consultation. Dr. Snell was amazing! I highly recommend her for anyone who is a high risk for melanoma! She did an excellent job! Very throughough and the office was well run. Not that friendly. Her interactions could come off a bit condescending. She is knowledgeable of her craft but she does not offer good suggestions for people of color - or seem to consider the differences in treatment options based on variousfactors. I walked away with lots of prescriptions but no clear explanation as to why. I left feeling unsatisfied. Lovely! Would recommend to anyone looking for a new Dermatologist. Very professional and knowledgeable - great manners and was able to assess my skin condition quickly. My only complaint was the amount of time I had to wait and how quick the appointment was. Appointment with doctor felt a little rushed. She was professional, knowledgeable, friendly and quick. I was only in there for about 15 min (annual skin screening) but I would highly recommend her! This was my first visit with Dr. Snell. She and her assistant were very thorough, professional, and good listeners. Unlike some doctors' visits, this one did not feel rushed. Dr. Snell answered all my questions, gave me requested referrals,and prescribed appropriate tests and medications. I was very pleased and will recommend her without hesitation! Dr. Snell was friendly and warm. She asked questions, listened, gave her diagnoses, and I was good to go. I went in for hives and the medicine she prescribed me has been working well. Dr. Snell was extremely informative and kind. She was willing to listen to my concerns so that we could form a treatment plan that works for me. Appointment was very easy and Dr. Snell was very professional. My only complaint was that she was in and out in 2 minutes. She tried to extract a pore, but wasn’t able to. Probably one of the worst experiences I have ever had with a doctor. Very alarmist . Does not take the time to take the whole context of the patient’s history when determining a course of action. I train medical students onbedside manner and compassionate care and although Dr. Snell is friendly, she is completely unprofessional in the way she spoke to me and the way she handled my concerns. This is a review for the medical side, not cosmetic. Do not see this doctor if you experience health anxiety because of the alarmist approach. I am very proactive about health but I felt she took it to another level. Doctor Snell was very thorough, as well as attentive to my questions. Everybody at the office was very friendly, treated us with respect and professionalism. Dr Sarika was amazing. She took her time with us, examined and explained everything by detail. This was the first time I was seen by the Dermatologist andnot by medical assistant as many Doctors tend to do. Recommend this place 100%. What a friendly staff and helpful, informative doctor! I would highly recommend to anyone. Don't feel like she is a true partner in my health. After months going to multiple docs at this practice I gave up and found a better doc who actually listens and cares about making me better. If you go here,prepare to go in and have a bunch of prescriptions thrown at you. Dr Snell visibly wants to be in-and-out of the exam room, and appears put-out when the patient asks clarifying questions. Never felt good or empowered to get better leaving this office - only left feeling confused and a little more broke. She took off 3 moles and left terrible scars. Dr. Snell had excellent bedside manner, and she acted fast to make sure I was taken care of. Dr Snell, Was professional, compassionate and very informative. I would recommend her to anyone..
As with other docs at this practice, my visit felt rushed, I got unsatisfactory answers to questions, and I left with multiple new prescriptions that I didn't understand. Every time I come to this practice it's such a whirlwind that Ileave feeling confused and rushed, and with multiple new prescriptions/diagnoses and no continuity between visits/earlier diagnoses. The medical assistant staff is excellent but the docs need to spend more time with patients. I was expecting a visit to setup another visit, but was promptly seen and issues were resolved in the first visit. Everyone in the office was nice. Very efficient. Friendly front desk staff. Overall good experience. Very prompt and courteous. I'd already gone in with a general idea of what was going on, so she answered my questions and sent me on my way with some straightforward solutions. The staff was great too! Thanks for making the apt a breeze! Dr. Snell was very knowledgeable and took time to explain everything she was doing and looking for. Only had a quick in and out check up for a blemish, but really enjoyed talking with Dr. Snell about other concerns, too. Would definitely go back again and plan to make an appointment for a more thorough physical exam. Dr. Snell was great! Very thorough and professional. She made sure I understood everything we went over. Dr. Snell was very professional and had a lovely bedside manner. I saw her for an annual skin screening, which was quick and comfortable. She was also able to take care of an imperfection on my nose and a small miliain the same appointment, which I appreciated. I had one concern that Dr. Snell wasn't able to address, and she happily referred me to the appropriate specialist, who was also great. Highly recommend! Very friendly, to the point and quick. Answered all my questions and made me feel very comfortable. I really like Dr. Snell -- she has a great staff who update and maintain your records so that she is briefed on your background and aware of your reason for coming in when she enters the room. She doesn't tryto sell you on products or cosmetic procedures (uncommon in a dermatologist) and is ready to thoroughly address and speak to any concerns you have regarding prescribed path forward, or alternatives you may wish to discuss. Quick, efficient, but not robotic! I didn't feel like the doctor took my concerns seriously. Had a great visit with Dr. Snell. The office was running on top. I was in and out super quickly. Would highly recommend. She was knowledgeable and personable. Thorough exam; not rushed; good explanations. Office staff are on top of things - organized, welcoming, and friendly. No upsell, just the annual exam (which is getting hard to find these days). The wait was a little long, but in all honesty I was a few minutes late so that didn't bother me at all. I thought Dr. Snell was kind and straightforward. Because she is a woman of color and of coursea medical doctor, I felt comfortable with her recommendations for my skin. I trust that she knows what's best in terms of growth removal and its effects on pigmentation.